2016 is an important year for Asian and Pacific Islanders (APIs) – we are seeing many investments in our families and communities at stake. We are also seeing many opportunities to ensure our families and communities receive the resources and support necessary to thrive. Together we have the power to make a difference in this year’s elections: Between 2000 and 2010, Native Hawaiian and Pacific Islander (NHPI) communities grew 61%, and the Asian American community increased 46%. 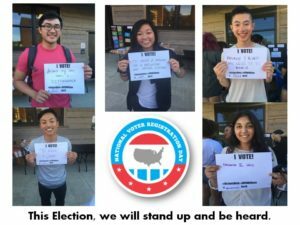 The API community could be key in deciding 5 House District races, but we need to vote and encourage others to vote! The following are resources provided by APANO to help make the civic engagement experience and process accessible. We have guides that explain ballot measures, elected positions, the voting process, candidate information, and more. More importantly, we’ve made many of these resources available in languages other than English! They include: Vietnamese, Marshallese, Korean, Hindi, Traditional Chinese, and Simplified Chinese. APANO is working hard not only to get out the API vote, but to also make decision-making and voting as accessible as possible to our API communities. Beginning October 27, APANO will be phonebanking every day for the 12 days leading up to November 8 elections to make sure people turn out to vote! Those 12 days take a lot of people power! Every hour you give us counts as we work to make sure we reach as many folks as possible! Contact Kathy Wai at [email protected] for more information, and click the button below to tell us which days you’ll be with us! I want to join #TEAM200! Who’s Who in Oregon Politics? What do Oregon’s elected officials do? How do their positions and actions affect you and your community? What are their responsibilities? 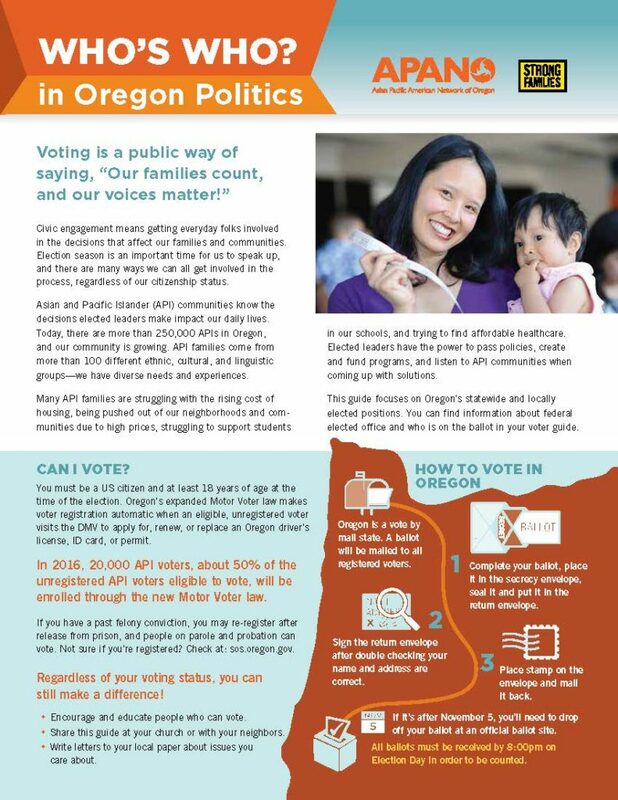 Learn more about elected positions in Oregon and how their decisions affect you. What ballot measures are appearing on November’s ballot? What do these measures do? What does APANO think about the measure? Why? Learn more about the critical ballot measures appearing on our ballots this November, and what they could mean for our communities. Why do you participate in civic engagement? Why is it important to you as an API-identifying individual? What makes voting and political education so important for you and your community? Read stories from community members and leaders regarding their civic engagement participation, and share your story! 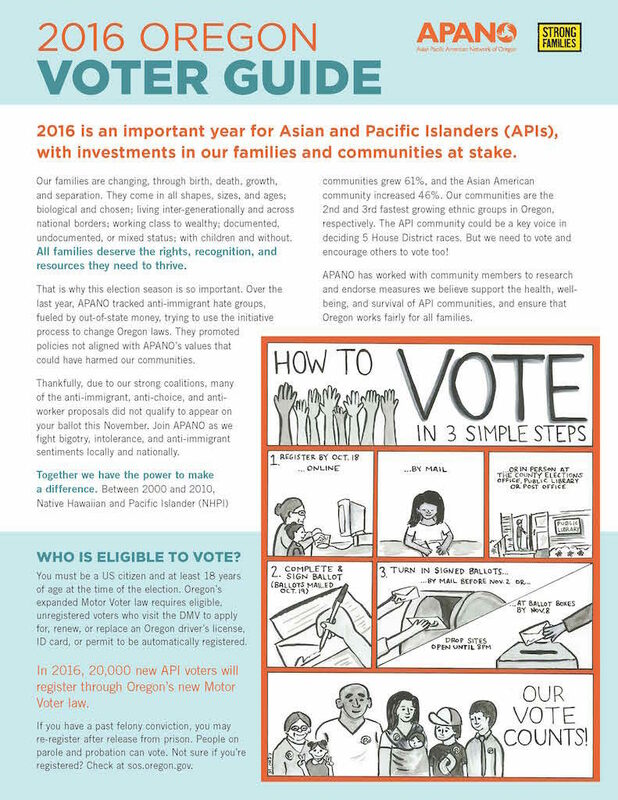 In this major election year, our vote can truly make a difference as the API population continues to grow across Oregon. APANO is hosting a special event to learn more about what is on the ballot this year – — with build-your-own boba tea! This event is meant for any Asian and Pacific Islander community members, whether you are a current APANO member or not! Come and learn about the major issues that voters will be voting on, ask questions, and engage in meaningful discussion. RSVP for Ballots + Boba! 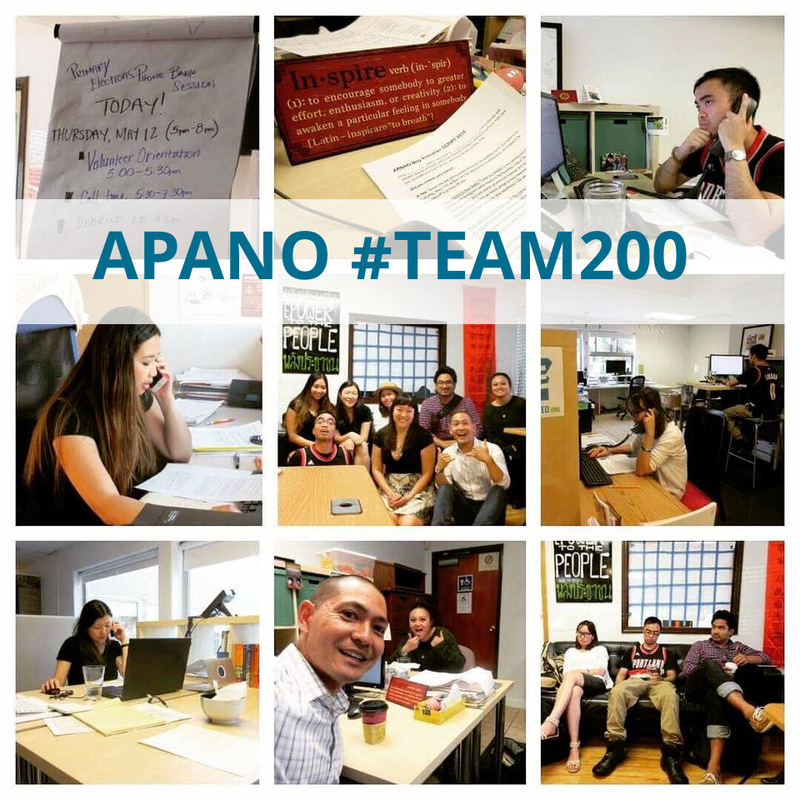 APANO reached out to candidates in several races that we identified as important elected positions for Asian and Pacific Islanders. Candidates were given equal opportunity to respond to a list of questions regarding issues important to APIs in Oregon. Candidates’ responses are post as-is, within our word count. APANO makes no endorsements and this information is educational only. How do you vote in Oregon?? The voter registration and ballot voting process is not always clear – that’s why we teamed up with Carolyn Chu to bring you a 3-step comic that explains how to register to vote and what to do when you receive your ballot in the mail. Translated version of this comic available. Just click here!